Running Time: 1 hr. 34 min. 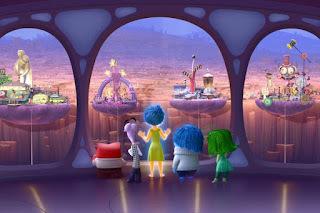 There aren’t many animated films that delve into vagaries of abstract thought, much less parsing such subsets as “non-objective fragmentation” and “two-dimensional perception.” But Inside Out embraces rather than eschews its psychological complexities, blending them into a kid-friendly adventure that appeals as much to the adults in the theater. It’s superlative cinema and a return to form for Pixar Animation Studios following a five-year predilection for amiable sequels. It’s the first Pixar feature-length film since 2013’s Monsters University, the studio’s first two-year gap between such releases since 2006. The film follows the travails of 11-year-old Riley Anderson (voiced by Kaitlyn Dias), whose parents suddenly uproot her bucolic, hockey-loving childhood in Minnesota and move cross-country to the netherworld of San Francisco. Choosing a bastion of vibrant, progressive culture as a foreboding, soul-crushing milieu is the film’s most subversive aspect. But the important setting is what’s going on in Riley’s head. Her mental processes are distilled into a quintet of anthropomorphic emotions: effervescent yellow Joy (voice by Amy Poehler), mopey blue Sadness (Phyllis Smith), flinching green Disgust (Mindy Kaling), petrified purple Fear (Bill Hader) and combustible red Anger (Lewis Black, unmistakable). Each guides Riley’s mood and encapsulate her memories into millions of glass orbs. The “core” memories power Riley’s five personality “islands”: Family, Friendship, Goofball, Hockey and Honesty. Once the wayward Sadness begins to clumsily infect Riley’s memories, it permeates Riley’s reaction to her new environment and the interaction with her parents. Joy and Sadness are eventually forced to navigate through Riley’s Long Term Memory in search a ride back to headquarters aboard her Train of Thought. Meanwhile, it falls on Anger, Fear, Disgust to cauterize Riley’s downward emotional spiral. Not surprisingly, the results prove counterproductive. It’s heady stuff made all the more intoxicating and poignant by the byways Joy and Sadness take on their journey—it’s a buddy film, too. Their sherpa is Riley’s erstwhile imaginary friend Bing-Bong (Richard Kind), a cotton-candied melange of raccoon, elephant and dolphin now consigned to the recesses of Riley’s consciousness. Heck, there’s even a Rosebud that figures into the storyline once we reach the “memory dump,” where old reminiscences, even the happiest, are discarded and disintegrate in order to make room for new ones … and apparently that lump in your throat. To regain its place atop the animated filmmaking heap, Pixar wisely turns to Pete Doctor, the director of Up, the studio’s last acclaimed original concept. 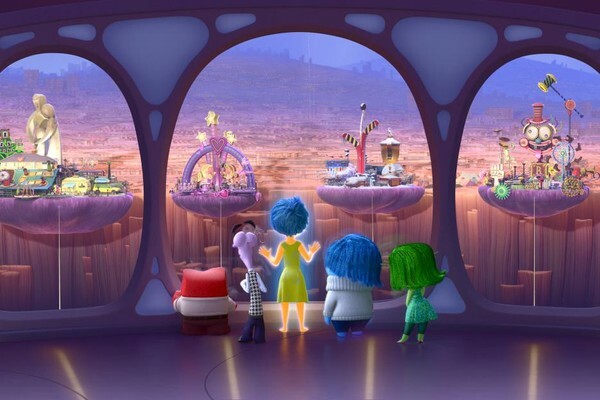 Inside Out’s animation is pedestrian, but its visual concepts are superb. Viewed from above, the circuitous shelving of Riley’s long term memory resembles a cerebral cortex. An Hollywood-style film studio is responsible for producing Riley’s nightly dreams. A foray into Riley’s shadowy Subconscious unearths such frights as a party clown and Grandma’s vacuum cleaner. One critique of Inside Out is that Riley’s inner crises are not catastrophic calamities, but instead the natural progression of a preteen on her way to adulthood. Just as Goofball and Hockey Islands won’t last forever, nor will Fashion and Boyband. But the film recognizes that maturation, highlighting the manner our divergent emotions necessarily interrelated, even the seemingly negative ones. You’ll laugh, you’ll cry and you may even think. It’s a mind trip with lots of heart.